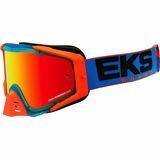 Wyatt J - StatesVegas Average Goggle "Usually wear Oakley's but decided to save some money and try the EKS S. I liked the fit and finish. They had a good seal with soft foam. Downside is the tear offs. I purchased a pack of standard tear offs for the first go. Unfortunately they don't fit. There are 4 tabs off the frame that kind of hold the tear offs off the lens in those areas. 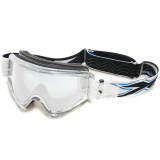 Because of this the tear off does not lay flat and which really inhibits the view through them. I tried tucking them under the tabs but that didn't work either as the tab is tight to the lens. Maybe I'll try the laminated tear offs or cut these down where the tabs are, or I'll buy another pair of Oakley's and throw these in the "I just wasted money tote"." Happy jack - Concord Ohio Good stuff "Works as good as any other brand, never had any issues."